You ever have one of those moments where there’s a big Pokemon on the board, and you just want it to go away? Well for the low low cost of 3 Energy, Shiftry-GX might just help! Shiftry-GX is a Stage 2 Grass Pokemon-GX, 240 HP, with a Fire Weakness, no Resistance, and a Retreat Cost of 2. 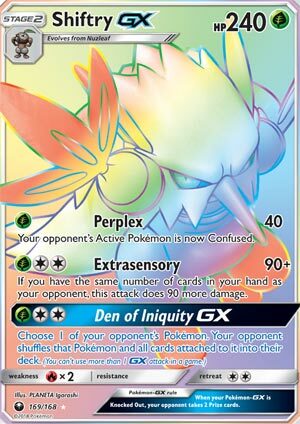 Perplex is its first attack, a 1-for-40 move that Confuses the opponent’s Pokemon. Extrasensory is a 3-for-90 move that does 90 more damage if you’ve got the same number of cards in hand as your opponent. And then for 3 Energy, Den of Iniquity GX can blow one of your opponent’s Pokemon back into their deck with all the cards attached to it. Note that if that Pokemon happens to be your opponent’s last Pokemon, you can still use this attack, and you will subsequently win the game for it. So having a callback of sorts to Shiftry (NXD) is nice and all, and considering the power of the GX Attack, it’s good to know it can only be used once per game, but other than that, does Shiftry-GX really warrant using? I mean outside of the GX Attack, is he worth running at all? Perplex is okay, 1-for-40 isn’t that bad, but Confusion isn’t exactly the best Status Condition…if anything, it’s actually the worst one. And I’ve talked about Extrasensory in the past being a bit of a hassle, what with manipulating your hand to match up with your opponent’s just for the sake of more damage. If you manage to get a good one in though, you could either OHKO an opposing Pokemon or else set them up for an easy KO on the next turn, so that’s at least a positive. Shiftry-GX definitely has potential, as any good Pokemon-GX does, but I feel like for the most part, he’s going to be either too slow to get off a successful Den of Iniquity GX or have too much trouble consistently hitting hard with Extrasensory. At least by comparison to other Pokemon-GX right now and what all’s going on in the shifting meta. I’m sure if Forest of Giant Plants were around that Shiftry-GX would be good…but at that point, wouldn’t there also be other better Grass Pokemon to use? Arora Notealus: Course I can definitely be wrong about Shiftry-GX, and he may subsequently prove to be a powerful Pokemon, especially in Grass decks that can run him. Den of Iniquity GX can definitely turn the tables on a number of decks with the right timing, and in rare cases even end up winning the game, but for the most part, he’s got a lot to work around before I think he’s competitive. Shiftry GX (CES 14) swoops back into the Pokemon Trading Card Game in the Celestial Storm expansion set. This Stage 2, 240HP Grass Type Pokemon has three attacks. Perplex does 40 damage and for a single Grass attachment leaves your opponent’s active Pokemon confused. We all know how well this works for Espeon GX, and there’s no reason to think that this couldn’t be a decent attack for Shiftry as well. Shiftry’s GX attack Den of Iniquity (GREAT name!) forces your opponent to pick up one of their Pokemon and all cards attached to it and shuffle them back into their deck. Shiftry’s main attack, however, Extrasensory, is what has people buzzing. It does base ninety damage, but that doubles to 180 if you have the same number of cards in your hand as your opponent. This is easy to accomplish as well as we now have reprints of both Judge and Copycat, cards that will allow you to achieve that status condition. Many players have also paired Shiftry with Zoroark GX to allow for potential additional hand manipulation after playing those draw support cards. Since resuming my statistical tracking, I’ve faced Shiftry twice and lost both times, but both times I was playing Rayquaza GX. I know my Koko / Lele / Shrines spread deck was eating the Shiftry Zoroark combo for breakfast (in fairness to Shiftry, my spread deck is 4 W 0 L against Zoroark decks post rotation) before rotation, and this duo seems like prima facie evidence for why I think Shrine of Punishment is making GX decks unplayable. Shiftry’s bigger problem, however, enters the format tomorrow. Dragon Majesty drops on Friday, and no single type gets more love from that set than Fire types. I’ve been saying for the past couple of weeks, get your Metal and Grass decks in now because once Dragon Majesty hits everything Metal and Grass goes back in the binder. I had thought that Frying Pan and Altar of the Sunne might offset this influx of Fire that we’ll be getting, but considering that a single Leaf Blower would knock off both Pan and Altar in one swoop, I think that it’s going to be tough going for Shifty and all fire weak Pokemon for awhile. Even looking at Shiftry in a vacuum and ignoring the fire weakness, it still just kind of strikes me as just another Stage 2 GX Pokemon that gets some play post release and then falls out of the face of the planet and we never see it again. Seriously, go to Collection in PTCGO, filter on Stage 2 GX Pokemon (owned and unowned) and see how many there are that just never see any use. It is what it is, there really aren’t very many excellent Stage 2 GX Pokemon, and Shiftry just seems to be in line with the majority of other Stage 2 GX’s that just don’t quite cut it. Another busy day, another placeholder review to (hopefully) buy time for a full one. The good points about Shiftry-GX? 240 HP, a single Energy attack with a decent return and bonus Special Condition, a three Energy attack that does mediocre damage BUT shoots to OHKO range when a moderately tricky condition is met, and a GX-attack that also costs three Energy that does away with one of your opponent’s Pokémon in a manner that won’t earn you a Prize but could still win you the game. Each attack requires only one [G] Energy, though the second and GX-attack also require [CC]; still, that’s affordable and creates a logical sort of progression. The bad news is that Shiftry-GX is a Stage 2 and [R] Weak; I’m not seeing a lot of great [R] decks this early in the SM-On Format, but that might be about to change. Dragon Majesty is the new mini-set that officially releases (via gift set) Friday, September 7th; while it focuses on [N] Types, giving them some nice new support, it includes a bit for [R] Types (and [R] Energy), and some of those [N] Pokémon run on [R] or mostly [R] Energy. Put it all together, and the [R] Type could be about to heat up again. Or not, which brings us to the stuff that isn’t really good or bad, but simply “is”: Shiftry-GX is a Pokémon-GX (duh) with a Retreat Cost of [CC]. Being a Pokémon-GX comes with its own pros and cons, while a Retreat Cost of [CC] is neither very high nor very low. Put it all together, and I think you could build a solid deck around Shiftry-GX. A brilliant one? Probably not. Perplex is mostly about having a budget attack, or one that can desperately try to stall. You’re dealing with a Stage 2, so I do NOT recommend trying to pull a bad Golisopod-GX impression by using Acerola or Max Potion to constantly shed damage counters while still hitting for small amounts of damage… I mean, Golisopod-GX hits for medium-sized amounts of damage, which is what lets it work. Extra Sensory is underwhelming if you just cannot sync your hand size to that of your opponent… but with a Choice Band, it still does enough to 2HKO most targets. If you can either naturally match your opponent’s hand size, or afford to play a Copycat, Judge, or Marshadow (SHL version) to force both players hands to be the same size, Extra Sensory beefs up to 180 damage, with a Choice Band upping it to 210. At that point, you’re mostly only worried about protected Pokémon and Stage 2 Pokémon-GX surviving. Buzzwole-GX, Rayquaza-GX, Zoroark-GX, etc. are all going down in a single hit, so you just need to worry about someone still running Gardevoir-GX or making a [R] deck work. On paper, this looks pretty nice… but we’ve already got the results from our first major tournament of the SM-On Format (SPE Melbourne) and I’m not seeing any Shiftry-GX decks.